The year 2010, sees the 140th anniversary of the oldest surviving bicycle club in the world - the Pickwick Bicycle Club. The Anfield Bicycle Club, founded in 1879, proudly claims the same heritage and unlike the Pickwick Bicycle Club is still active as a club for cycling. The Pickwick BC is now predominantly a luncheon club with only the demise of an existing member allowing entry. 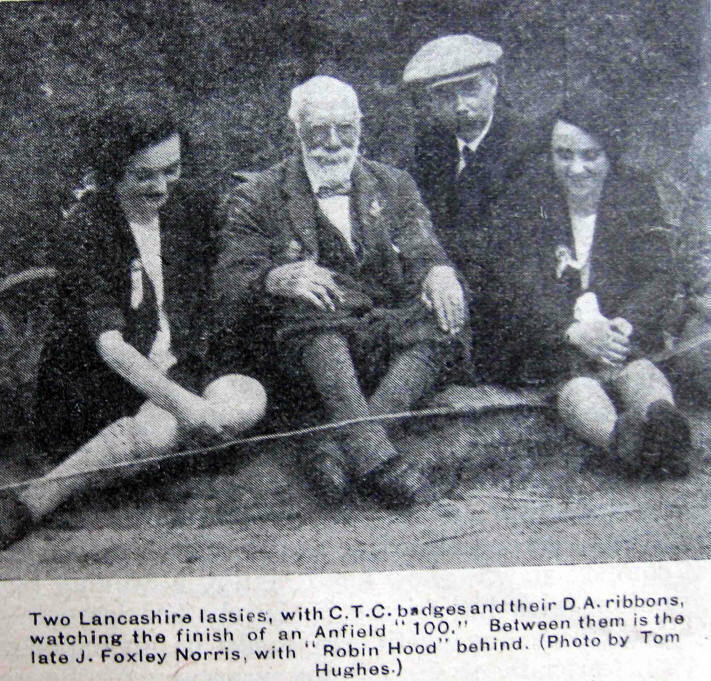 As a reminder of days long gone, we have this extract, describing the early days of the Pickwick BC, from the 1928 year book of the Liverpool District Association of the Cyclists Touring Club. We know nothing of the author, J Foxley Norris, apart from the fact that he was born about 12 years before the Pickwick BC was founded. 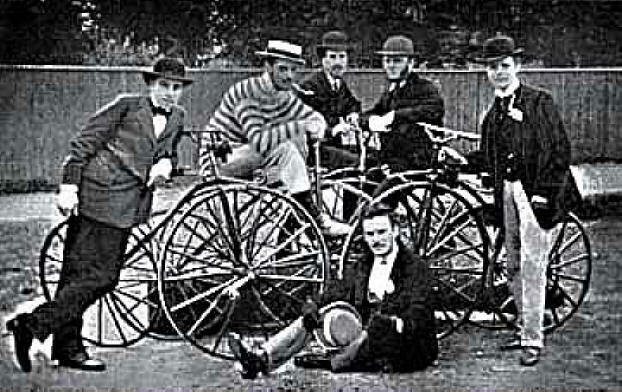 The original Pickwick Bicycle Club members on a club ride in 1870. Their machines are 'boneshakers' with wooden wheels, soon to be largely replaced in popularity by the high wheel ordinary with metal spokes and rubber tyres. It was from such a modest beginning that a famous cycling club has evolved, and a life of fifty eight years has not dimmed its lustre or reputation, but it continues its active old age with about two hundred members. The history of the Pickwick BC is an epitome of cycling from its earliest days. The usual runs in the early 1870s were about ten miles out, and a radius of 20 miles would well constitute a Sunday or weekend fixture. Such riding may seem trivial to the rider of 1928, but he will be reminded of the weight of the 'boneshaker' - 60lbs with its wooden wheels, iron tyres, and the villainous character of the road surfaces. Nor must he be contemptuous when he is informed that the first race proposed in October 1872 to Huntington was abandoned as the weather was unsuitable. A lengthy account of an Easter Tour by the Pickwick and Surrey BC appeared in the 'Daily News' of April 21st 1873. The party is recorded as stopping the night at Margate, Rye and Brighton. In the same year the PBC organised a 20 mile race to Ware, which was won on a 48'' wheel in 1hr 28mins. An interesting race on Aug 9th 1873 was promoted in the Royal Surrey Gardens. The track was improvised, being composed of boards laid down wherever a way could be contrived around and about the paths, bushes, flower beds and the varied landscape effects of the old gardens, as I well remember them. The track, such as it was of about eight laps to the mile, was a twister; and the riding colours - scarlet, green, blue, pink and yellow - whilst sounding gaudy, were only bands of ribbon tied around the arms. Fancy trying a similar race now! On the 10th September 1873 the Surrey BC held a race meeting at the Oval, consisting of a four miles, and a one mile handicap, and a slow race of 100yds. In the Field of 17th June 1876 a notable ride is recorded by H Stanley Thorpe of the Pickwick BC. The two hundred miles from London to York was accomplished on a 50'' Ariel weighing 66lbs under 23 hrs. Towards the end the rider increased his speed to ten miles per hour. In 1874 again, David Stanton, publican and professional cyclist, essayed to ride from Bath to London on a 56'' wheel in eight hours. He declared that at Colnbrook men threw sledge hammers at him, and stopped him finishing. That was fifty three years ago. I have ridden about fifty bicycles of all sorts since. In the last six months, at the age of seventy I have ridden more that 5,000 miles. What shall I say? Go! and do likewise. 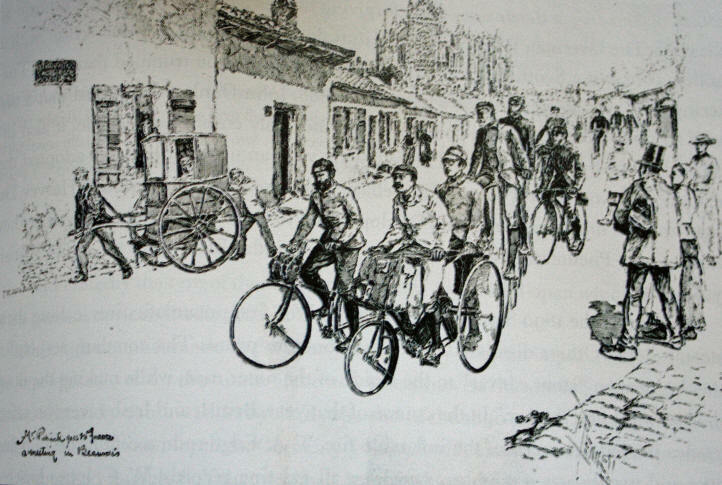 The Pickwick Bicycle Club in an expedition to France in 1884 that included a tandem tricycle, several of the latest hard tyred safety bikes and a number of high wheel ordinaries.